Slade Alive, Vol. 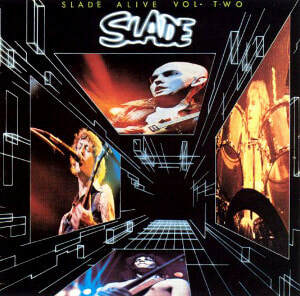 2 is Slade's second live album, released by Barn Records on 27 October 1978 and produced by Chas Chandler. It failed to chart. Titled as the follow-up to the band's commercially and critically successful 1972 album Slade Alive!, the performances on Slade Alive, Vol. 2 were taken from the band's Autumn 1976 tour of the United States and their Spring 1977 UK tour. Having returned from the US in late 1976, Slade found the UK music business much changed from when they had left in 1975 to try and crack the American market. Punk rock had become the dominant influence on youth culture and the music press. Despite Slade's reputation as a song live act, the band's new releases were not commercially successful. Regardless, Slade were determined that they were now a better live act than ever and refused to call it a day. Their 1977 album Whatever Happened to Slade was a commercial failure and on their UK Spring tour, the band found they could no longer fill large venues. The following year saw the band continue to suffer commercially with their new records all failing to chart. With the band's new output no longer being released on Polydor Records but instead on manager Chas Chandler's label Barn records, singles such as "Burning in the Heat of Love", "Give Us a Goal" and "Rock 'n' Roll Bolero" were all chart failures. In the hope their live reputation would result in some chart action when released on record, the band released Slade Alive, Vol. 2 in October 1978. However, it too was a commercial failure and Slade would only regain popularity after performing at the Reading Festival in 1980. Record Mirror reviewed the album and wrote: "This album, while patchy, confirms my opinion that they could still have something going for them... enough to make this record a worthwhile, if not exactly essential purchase, and enough possibly, to get the group back on an even keel. Their big problem, however, the one I cant seem to see a solution to, is the same old one of material: the oldies are still way the best. Slade are essentially a live band, no matter how good their records are, they'll never match up. All they will ever be are plastic souvenirs of a great live show." Superpop commented: "Slade have been one of the busiest live bands on the scene recently and this LP shows exactly what is actually going on. Somewhat unknown today seems very strange, but times change and believe it or not Slade have. Slade present us with a neat little package. One complaint though, they did not include their recent single "Rock 'n' Roll Bolero", a classic no doubt, oh well, we can't expect too much can we?" Dave Murray of the Reading Evening Post stated: "Listening to this, you begin to realise why Slade aren't a bigger band today. They're loud and they're fun, but the fate they suffer is no different from other rock 'n' roll bands who teeter on the edge of heavy metal but with one foot still stuck firmly in the Top of the Pops studio. Headbangers won't accept that you can be a live band and a singles band at the same time." Geoff Ginsberg of AllMusic retrospectively said: "Slade Alive, Vol. 2, like all live Slade, is searing. Unfortunately, it was released into a void in 1978. The album is excellent, both in terms of performance and sound quality. They also did a great job of selecting material for this disc. A nice balance of classics and newer material that hadn't really been heard before. Slade has by this point developed into a full-fledged heavy metal band while retaining everything that made them great in the first place. A very strong outing that got the band nowhere. The tastes of the fickle public cannot be predicted, so Slade just continued to do what they did best. Make rock & roll records, and annihilate eardrums whenever they played."